Disclaimer: In this piece we are offering a broad-brush advocacy for therapeutic psychedelic use coupled with rigorous scientific research. However we are research psychologists, not medical practitioners and we are not offering tailored medical or mental health advice. Furthermore, outside of narrow religious and research use, any psychedelic use is illegal in the U.S., and we do not recommend breaking the law. Imagine a substance so powerful that, when used in the correct context, it could permanently change your personality in the direction of greater openness and inspire flow states of heightened creativity. It could help treat the depression or mood disorder that you’ve had to endure despite countless ineffective therapies. Indeed, although the substance is technically a drug, it could help you break addictions to other drugs. Finally, this substance could give you some of the most meaningful experiences of your life, including mystical ones imbued with an unrivaled sense of clarity, unity with your surroundings, and profound knowledge experienced at an intuitive level. If you were a religious sort, it could deeply strengthen your religious beliefs and spiritual connection. Imagine what you could do with a substance like that in the interest of bettering yourself and the world, from helping you design incredible architecture like Machu Picchu or amazing technology like the iPhone, to easing suffering by providing people with a sense of meaning and peace with their own mortality. And imagine that this substance is incredibly inexpensive and easy to use. One might view this substance as a gift from heaven. Well, the reality is that this substance—in fact, many forms of it—do exist. It has been used by humans around the world for millennia. It is known most commonly under the umbrella term of psychedelics although other terms like entheogens or hallucinogens are used. Classical psychedelics are those that bind with the Serotonin 2A receptor in critical regions of the brain for example psilocybin, DMT, mescaline, and LSD. These restrictions were not just for children or for recreational use, but for all use, with the exception of very expensive and highly regulated research, and some religious ceremonies—and these exceptions were only allowed after legal battles. These agencies even banned potential drugs based on the existing ones so people couldn’t develop new variants. In a sense, the government banned chemical access to a state of mind. Before they were banned, psychedelics had given us insight into human nature. In 1943 Albert Hoffman’s discovery of LSD propelled the understanding of the role that neurochemistry plays in mental illness and brain function. The discovery was highly controversial because it sat outside the behaviourist paradigm that was dominant within psychology at the time. Hoffman’s discovery proved prescient. Over the next half-century, drugs were developed to treat disorders like depression, the most popular of which are selective serotonin reuptake inhibitors (SSRIs). Yet while these are effective, they are often taken for a lifetime, cost a great deal of money, and have compromising side effects such as sexual dysfunction. After 1966, creatives could still drink coffee and alcohol and smoke cigarettes, but even cannabis was banned as Schedule I. By the 1970s, prisons had filled up with offenders convicted of drug crimes, and we received the cultural blessings of cocaine and disco. We argue that the decision to ban therapeutic use of psychedelics was a tragic mistake. As was the massive restriction of the scientific investigation of these drugs. Doing so clearly—if unintentionally—benefited operators of the prison system, pharmaceutical companies and people who just wanted to bust hippies. It harmed everyone else. And as supervised therapeutic use and scientific investigation stalled, people still continued to use the drugs recreationally, so the actual risk to citizens probably increased. We hope to make the case to legalize psychedelics for therapeutic use, including for psychotherapy, self-discovery and creativity, and for research. We will not make a case for recreational use or use by minors. This is part of a larger discussion of how much freedom people should have and at what level of maturity—the argument for freedom is crucially important but falls under a much larger concept of liberty. We are making what is essentially a pragmatic argument. 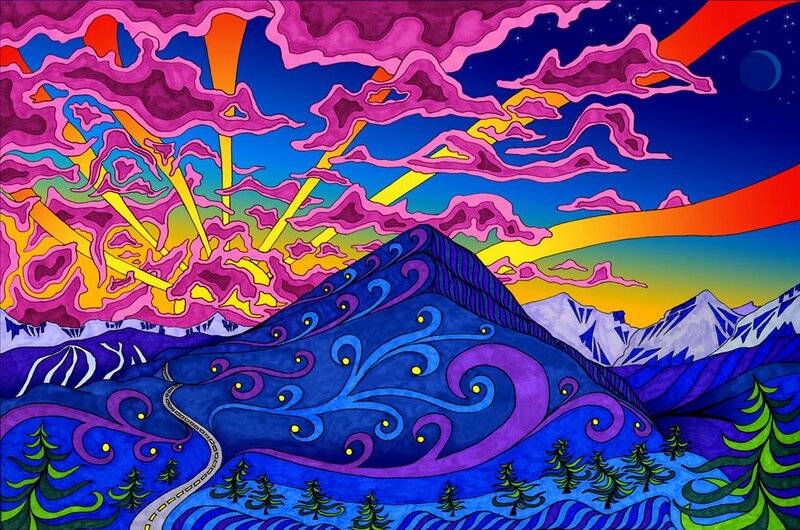 Legalizing psychedelics will ease suffering, promote economic progress, and propel religious and or spiritual growth. Another risk may be the link between psychosis and psychedelic use. This link dates back to reports of “acid casualties” during the 1960s. Indeed, in his clinical practice, paediatric psychiatrist, Charles Grob, attests to having observed hallucinogen persisting perception disorder (HPPD), in which a trip never seems to end. Nevertheless, recent population-level data suggests that this link may actually not exist. The population-level risk of psychosis is of unclear size but appears to be similar to what is reported for cannabis. (Of course, for individuals with a genetic predisposition towards conditions such as schizotypy or schizophrenia this risk may be amplified). A third risk is that a person under the influence of these drugs may be more susceptible to exploitation. And this risk is not negligible. It is also one of the reasons why the Central Intelligence Agency (CIA) experimented with psychedelics themselves. Incidentally, the CIA may have inadvertently spurred the hippie movement in the Bay area when they selected Robert Hunter, legendary song writer for the Grateful Dead, and Ken Kesey, author and Magic Bus funder, to try LSD as part of the experimental MK Ultra project. The CIA found LSD to be ultimately inadequate for inducing mind-control or veracity, but recent research has found that LSD can make people more suggestible to influence. Today, individuals may be increasingly putting themselves at risk when, forced to leave their country to experience these substances—for example via ayahuasca retreating—they fail to do enough research and find themselves in the hands of an unsavoury shaman. Psychedelics truly are no joke. However, the pros appear to outweigh the cons, especially when the cons are conscientiously and responsibly addressed. Below, we discuss the use of psychedelics in psychotherapy, creativity and innovation, and religion. The use of psychedelics in psychotherapy has a surprisingly long history. In fact, as early as the 1950s and 1960s, psychedelics were used as an accompaniment to psychoanalytic approaches to psychotherapy. One early practitioner was Stanislav Grof who used psychedelics as a means of exploring unresolved emotional trauma. Although interest stalled due to government bans on these substances, over the last ten years interest has been renewed. Some have called this renewed interest a “psychedelic renaissance,” as it has resulted in research targeting all manner of mental disorders such as treatment-resistant addiction, depression, existential anxiety otherwise known as terminal illness-related anxiety and depression. For example, a recent study used psilocybin to give people with late stage cancer a greater sense of peace as they faced death. Ibogaine, derived from the Iboga plant and used in traditional Central African medicine, is theorized to be able to suppress the cravings for opiates. These cravings return if people go back to their old life because so many addiction cues remain present, but ibogaine-assisted psychotherapy appears to furnish addicts with an invaluable start on recovery. The mechanism of action remains somewhat unclear for these treatments, but scientists agree that the effects stem not only from neurochemical exchanges, but also from the experiences people have—the thoughts, feelings, memories, that percolate up. That is, action is not only taking place on the physiological level, as with most drugs, but also on the experiential level. Some specific proposed mechanisms include mystical experience, lowered experiential avoidance and increased psychological flexibility, enhanced emotion regulation, loosened i.e., unconstrained, childlike cognition where many more neural pathways are opened up. And that psychedelics have been found to be efficacious in the treatment of addiction probably should not come as a surprise. When Bill W. founded Alcoholics Anonymous (AA) a key insight was that recovery from treatment resistant alcoholism needed a spiritual impetus—the craving, destructive “ego” of the addict had to be realigned with a much broader and more profound sense of “Self”, in Jungian terms, or the “Higher Power,” in AA terms (in fact, Bill W. wrote a letter to Jung to thank him as well as William James for his work on religious experience). Among the tools that Bill W. turned to for spiritual realignment, LSD was central. Most people today think of psychedelics as recreational drugs, but Bill W. regarded them as conduits to mystical experience and God, LSD being chief among them as the most rapid way to get there. In sum, psychedelics have the potential to ease a great deal of suffering through their use as psychotherapeutic tools. In all modern research studies, psychedelics are used in conjunction with other validated therapeutic tools, such as cognitive behavioral therapy, and the care of skilled professionals. At the same time, the serious risks associated with psychedelics mean that administering them within a controlled setting by licensed clinicians is advisable. We are not arguing for self-administration. Our economic system in the West increasingly depends on creativity and innovation. One element that is crucial to creativity and innovation, if not overlapping with it, is a trait known as “openness to experience”, for which the common shorthand is openness. We can induce creativity in structural ways, but we also depend a great deal on visionary leaders who are dispositionally gifted with a vision for alternate realities and possibilities. Creative vision involves the capacity for divergent thinking where associations are drawn between disparate and ostensibly distant concepts (see tests of divergent thinking). The simplest form of this are tasks such as: “How many unique uses can you think of for a brick?” Responses can range from tight associations, like “build a wall;” to moderate associations like “heat the brick up and use it to cook a fish;” to loose associations like “grind the brick into powder and make paint.” To be clear, creativity isn’t everything. You need intelligence, conscientious execution, competence and management to make an organization work. But creativity is critical to success in a growing and highly competitive economy. In most industries, static organizations don’t last. Our pantheon of great business leaders is filled with creative visionaries: Walt Disney and Steve Jobs are now household names (to be clear, we are not stating that Disney used psychedelics for creativity —he had access to a good deal of childlike imagination and super high intelligence). And there would be great value in cultivating more people who are equipped to engage in arenas of hard-nosed business, able to intelligently understand complex technologies, and also express a visionary, creative side. Indeed, creativity is associated with successful entrepreneurship, and the creative class may increasingly and disproportionately contribute to gross domestic product (GDP) in the modern global economy. Yet, open individuals tend not to be overwhelmingly attracted to or recruited towards sectors of business and technology—students high in openness instead gravitate to the arts and humanities, indeed, Steve Jobs life story looks more like an artist than a business tycoon. One solution to this challenge is to take highly conscientious and hard-headed business people and engineers and bolster their openness later in life. These individuals stay on track. They’re not the ones who take off to travel the world, write poetry, or follow the Dead. Psychedelics may offer one mechanism to make this happen. In one study, a team led by Catherine MacLean, working alongside the famous Johns Hopkins psychopharmacologist, Roland Griffiths, administered a small dose of psilocybin in a calm and introspective setting accompanied by a session monitor. The result from this single experience—and one that could be reproduced for minimal costs—was that for the half of the participants who had a mystical experience, their openness scores increased by about a full standard deviation, an uncanny change that remained present a year later. From Petri, G., Expert, P., Turkheimer, F., Carhart-Harris, R., Nutt, D., Hellyer, P. J., & Vaccarino, F. (2014). Homological scaffolds of brain functional networks. Journal of The Royal Society Interface, 11(101), 20140873. The results of this study suggest that the homological structure of the brain’s functional patterns undergoes a dramatic change post-psilocybin. To be clear, it is a long way from a single study to the next Apple or Disney. But the possibilities are compelling. Imagine the economic benefits of increasing the openness of a cohort of super-intelligent and highly conscientious tech engineers. There is a reason that the tech boom and the Summer of Love emerged from the California Bay Area. Creatives like Steve Jobs used psychedelics for self-exploration and insight. Jobs even famously attributed Bill Gates’ poor inventiveness to not having more seriously experimented with LSD. It should come as no surprise, therefore, that psychedelics are currently being used in Silicon Valley as programmers leverage every tool at their disposal to innovate at work. The problem with this individual biohacking approach is that it is illegal and also risky, based on the unknown quality of the substances used. And there is also little accretive knowledge from underground biohacking—although, if it is recorded even anonymously—there is potential for hypothesis generation. Science is slow, but ideally it is enduring, and can generalize. We believe that the effects of psychedelics on creative problem-solving should be examined in research contexts at universities or hospitals. The next step would be to responsibly permit the administration of psychedelics within creativity centers. Work like this is starting to happen in shamanic centers, for example, where it is not uncommon for engineers to solve impossible work problems in the course of their ayahuasca ceremonies. Currently, we are working with Pulse tours in Peruvian Amazonia to examine mystical states and changes in openness following ritualistic use of ayahuasca, but the scope and scale of this work could and should be increased by several orders of magnitude. Many religions use psychedelics for ceremonial reasons. These include the ancient Greeks at least 3,000 years ago as part of the Eleusinian mysteries, as well as by traditional animistic religions, but also in branches of Christianity. Examples of the animistic religions include the use of ayahuasca, a brew designed to make the oral ingestion of DMT possible and long lasting, in the Amazonia basin (see image); peyote, a cactus-based product containing mescaline, in the U.S.; Ibogaine, derived from a shrub, in Central Africa; psilocybin, derived from mushrooms all over the world. In all these cases, the religious use of psychedelics is actually legal. In the countries of Amazonia because it is such a central part of their cultural history and in the U.S. because of the basic right to religious freedom. Where we see the most interesting potential for psychedelics is in mainline religions, especially Christianity. (Note: We are not arguing for the existence of God or for the importance of religion. We are making the more narrow argument that given the range of Christian churches, the mainline traditions play an important cultural role, including in education, community formation, and community service and thus should remain in the cultural portfolio of churches). Mainline churches in the US are dying off. They don’t offer the spiritual or social benefits of more evangelical, non-denominational Christian churches. And some individuals are leaving the church because they just don’t believe in the myths and stories. Psychedelics have potential to change this by inducing mystical experiences that can support the belief in God—or an individual’s subjective understanding of God. A classic study, best known as the Good Friday Study, gave seminary students psilocybin or a placebo before Good Friday mass. The students in the psychedelic condition reported highly meaningful experience, mystical states, and a deepening of faith. This experiment has been replicated at least twice but with tighter methods. The results have held up. As it stands, there are a handful of Christian sects that actively use psychedelics, including the Santo Daime church in Brazil, and the Native American Church (NAC) in the U.S. These tend to be aligned with more traditional, animistic faiths. But there is no reason that psychedelics could not be used in, say, the Methodist or Baptist church. In fact, some scholars speculate that the “burning bush” may have been a metaphor for wisdom conveyed to Moses via the psychoactive properties of the acacia plant. Incorporating psychedelics into the church structure of course accompanies the notable risk of connecting practitioners directly to a “higher” presence, thereby obviating the need for a priest class of intermediators. Although the protestant reformation was built on uniting each follower with God, this goes a step further. Anything that offers direct access to the divine asks that clergy shift their role from interpreter to guide. In this sense, psychedelics are a potentially disruptive and disintermediating force, just like file sharing services were to music, ride sharing services are to licensed taxi, and bitcoin is to central banks. Another risk is that psychedelics can be seen as a potentially short-lived shortcut to spiritual connection, allowing people a glimpse into a numinous sphere, but not allowing these same people to integrate the experience into the bedrock of their lives. We would suspect that the mystical vision would have the most potent and long-lasting spiritual effect when used in the context of sustained spiritual practice and belief. It is possible that with legalization some people could use psychedelics to widen and deepen religious experience after a sustained consistent practice, but we just don’t know if they will have a lasting effect without ongoing practice. Finally, we are discussing this issue in the context of a formal religious belief, whether it be animistic or monotheistic. There is of course a booming interest in non-religious spiritual practices and beliefs with accompanying moral and ethical systems in which psychedelics can and do play a major role. This is a large topic we will table for another discussion. In sum, psychedelics have the potential to bolster religious life and a sense of connection to the divine. This has been known throughout history, but at present, this wisdom has been sequestered, potentially limiting each individual’s opportunity for spiritual fulfilment. Scaling access to this wisdom up could be transformative. Psychedelics are incredible tools whose significance lies in their ability to catalyze the power of the human mind for healing, creativity, and spiritual consciousness. Like any powerful tool they are also not without risks. As it stands, except in the case of religion and a few countries, they are used underground and without mental health screenings, safety protocols, and reliable substance quality or dosing. We believe that there is a tremendous potential to use psychedelics in controlled environments designed to increase benefits and minimize risk. There is always a balance between potential benefits and harms, but we believe that even today, after not more than ten years of resuming serious scientific investigation, the balance leans toward the side of permitting the responsible use of psychedelics to decrease suffering, increase innovation and creativity, and expand spiritual and religious life. To put this trade-off in perspective; acetaminophen helps with headaches and kills around 150 people a year, and this trade-off is viewed as acceptable in our culture. Psychedelics offer people the opportunity to have incredibly meaningful and long-lasting emotional, intellectual, and spiritual transformations with modest downside risks. It is time. Isbell & Chrusciel, 1970; WHO Expert Committee on Drug Dependence, 1969.
 see Johansen & Krebs, 2015 for more detailed summary of events. W. Keith Campbell is professor of psychology at University of Georgia. He has written several books on narcissism including The Narcissism Epidemic. Brandon Weiss is a graduate student in the clinical psychology program at the University of Georgia. Just a note, your article states Peyote contains DMT, when in fact it contains mescaline. You are correct (as does San Pedro cactus in South America). I even proofed the article before it went up and missed this. Thanks! Thank you Alex — I have corrected the article to reflect this. Some varieties of the acacia tree contain DMT. Excellent article. Perfectly echoes my sentiments on these remarkable chemicals. On a funny note, I expected your “people who just want to bust hippies” link to go to something like this. And on an esoteric note, I’d like to emphasize how widely “creativity” might influence human endeavors—physical endeavors, as well as mental ones. This fascinating article explores the historical and functional link between psychedelic use and performance in “extreme” sports. While I’m not sure what policy prescriptions we might glean from it, it certainly merits some attention, touching as it does on a topic close to many people’s hearts: that of athletic pursuits. More broadly, it hints at the utility of psychedelics in regards to a holistic, “sound body, sound mind” approach to health. If Steve Jobs had continued tripping maybe he wouldn’t have knowingly gone to his grave trying to sell even more gadgets with glowing fruit on their lids. Maybe he’d have done something more meaningful with his unimaginable wealth. Maybe something like the Bill (“poor inventiveness”) and Melinda Gates foundation. Anecdotes can be instructive, but they need to be stand-out clear. From your link to Job’s tripping buddy: “Jobs’ experiments with LSD stopped once he launched Apple, however. ‘Once Apple started, Steve was really focused with all of his energy on making Apple successful… and he didn’t need psychedelics for that.’ “. When they were tripping they were young. Have you noticed how folk stop tripping later in life? Being a young adult is almost synonymous with being open to new experience. It makes sense; one is reaching out to find the opportunities and niches where one can find reward and fulfillment. Arguably drugs are undercutting that motive; short-circuiting the normally information-driven highs (and lows) of life. Similarly, religious experience is arguably another means of accessing possible states of mind, but in this case it is information based; information in the sense of brain input that modulates experience. But not necessarily good, or “correct” (in the sense of true) brain input; religion is usually bad information. The article attributes the term “wisdom” to “psychedelics have the potential to bolster religious life and a sense of connection to the divine”. I’m not sure that’s particularly wise. What would be wise would be a thoughtful argument about a reality based, secular spirituality accessed via drugs, meditation, contemplation, or a deep understanding of our nature and the extents of experience available to us. Without the voodoo. I applaud the spirit of this article and it’s aims of decriminalising psychedelics, wether for research, therapeutics, personalty manipulation, or possibly just life enrichment. But the argument doesn’t need to support mythology. Excellent article. Thanks much for posting. Based on my experience, I would include hash-hish as a psychedelic drug. The one waking out-of-the-body, “kundalini” experience I had was induced by hash. Many years ago, but still “with” me, sort of. In a good way. I mention hash because it might not be, as are the other drugs, considered to be an “illegal” drug where marijuana is “legal”– tho is is, in my experience, drastically more powerful, and qualitatively different. Previous PostApplebaum vs. Fitzpatrick: Is History Political?